Breitling and Britain’s Bentley Motors enjoy the longest-ever partnership between a watch brand and an automobile manufacturer. In fact, it dates back to 2003, when Bentley, the world’s most admired luxury car brand, launched the very first Continental GT. Every detail in this unrivaled grand tourer reflected Bentley’s ongoing commitment to quality, luxury, and performance, and, fittingly, the company chose Breitling to design the onboard clock. It was the beginning of an important partnership for both brands, and now Breitling has announced the release of the Premier Bentley Centenary Limited Edition, which celebrates 100 years of luxury motoring excellence. 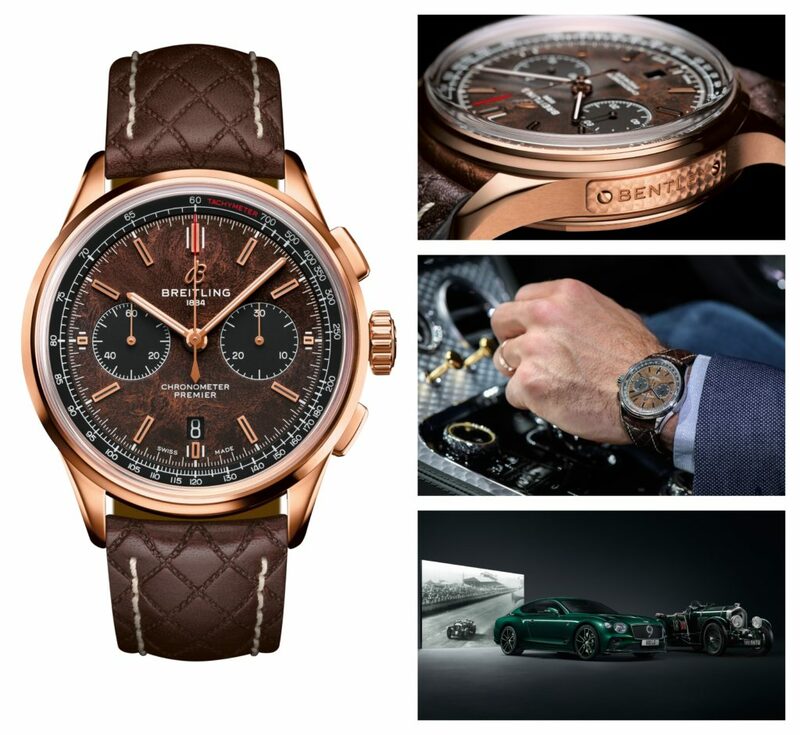 At this year’s Geneva International Motor Show, Breitling introduced the Premier Bentley Centenary Limited Edition wristwatch on March 5, 2019, to commemorate the partnership and celebrate Bentley’s 100 years of luxury motoring excellence. In 2018, Breitling introduced the Premier B01 Chronograph 42 Bentley British Racing Green, a striking wristwatch with a distinctive British racing green dial. The Breitling Premier Bentley Centenary Limited Edition is an exceptional member of the Swiss watch brand’s elegant Premier collection. Produced in 18 k red gold and stainless-steel versions, some outstanding design features distinguish these limited-edition timepieces from all others. The movement is visible through a unique transparent caseback featuring a Bentley logo. The 18 k red gold version is engraved with a “ONE OF 200” inscription, while the stainless-steel version is inscribed “ONE OF 1000”, confirmation of the edition sizes for the watches. The dial features a white tachymeter scale on a black inner bezel around the dial, with a red tachymeter inscription. 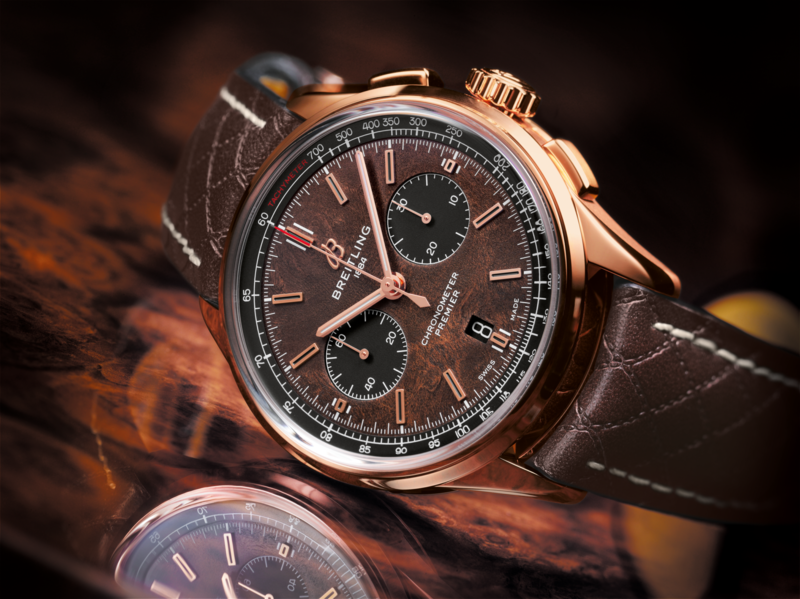 The Breitling Premier Bentley Centenary Limited Edition in 18 k red gold is presented on a brown leather strap whose pattern and stitching were inspired by the seats in a Bentley. 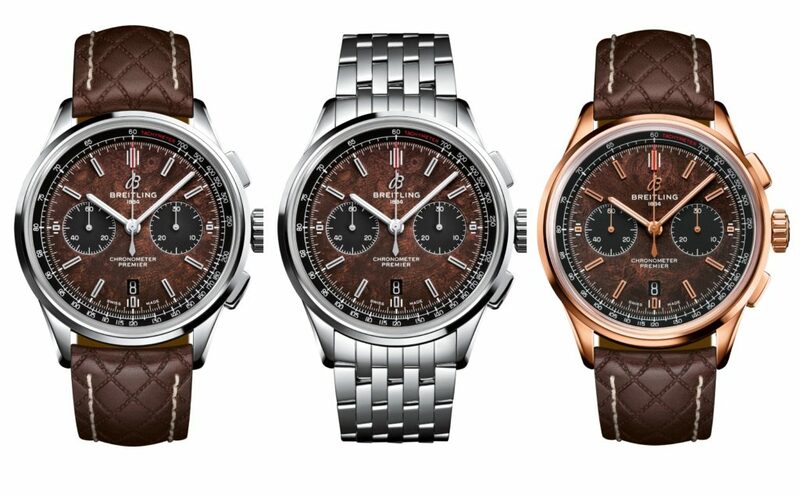 The stainless-steel version will be available on the brown Bentley-inspired leather strap as well or on a stainless-steel bracelet. On the left-hand side of the 42-millimeter stainless-steel case is a plate with an engraved “Bentley” inscription, whose design is based on the dashboard of the historic supercharged 1929 “Blower” Bentley. In the 1940s, Breitling introduced its first collection of truly elegant watches, which were defined by their fashionable flair. The new Breitling Premier collection combines purpose with style, delivering quality, performance, and timeless design that are worthy of the watch brand’s proud legacy. 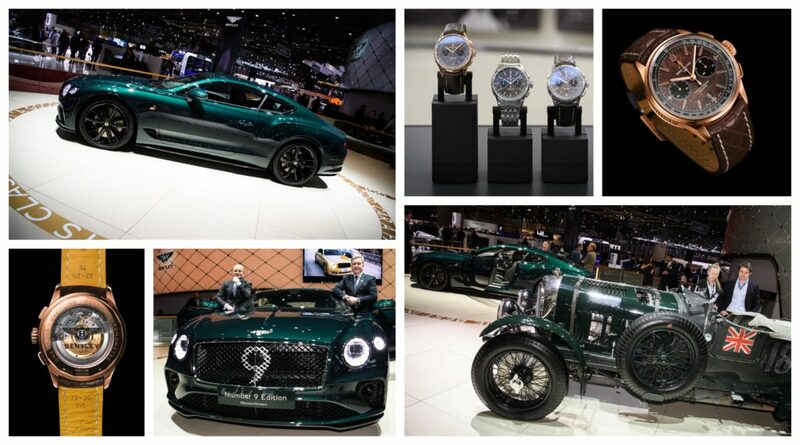 At the Geneva International Motor Show, Bentley celebrated its 100th anniversary with the introduction of the Centenary Limited Edition – Continental GT Number 9 Edition by Mulliner. On the same day, Breitling launched the Breitling Premier Bentley Centenary Limited Edition. While Bentley is known for its luxurious road cars, the brand also has an impressive history on the track. Between 1924 and 1930, the famous Bentley Boys and Girls won the 24 Hours of Le Mans race five times. That success, however, is not only a part of the brand’s distant past. In 2003, Bentley returned to Le Mans and took the first and second place finishes. At that edition of the world’s most famous endurance race, Breitling was Team Bentley’s proud main sponsor. Sir Tim Birkin was one of the legendary Bentley Boys, and it was in the No. 9 – his own car – that he raced and broke records in. It was his vision that brought a supercharger to a Bentley. While the official name of the car was “4½ Litre Supercharged,” they soon became widely known and admired as the “Blower” Bentleys. Perhaps the greatest of all the Blower’s races was the 1930 Le Mans, where Sir Tim drove the second of the five Birkin team cars, registration UU 5872 and carrying race number 9. In celebration of the car and its driver, the Bentley Continental GT Number 9 Edition by Mulliner features a wood insert from the seat of his iconic 1930 No. 9 Le Mans race car. Set in resin and situated in the middle of the center dial of the rotating display, it adds a tantalizing piece of history to each Limited Edition. When Sir Tim Birkin’s car was being restored, it was necessary to replace the wood insert, making the original wood available for a place of honor in the new automobiles. Since 1884, Breitling has established a global reputation for high-precision timepieces, its pioneering role in the development of the wrist chronograph, and its uncompromising commitment to design excellence. With the brand’s storied association with aviation, Breitling has shared the finest moments in humankind’s conquest of the skies. Renowned for its spirit of innovation, it has also earned a place of privilege in the worlds of science, sport, and technology. Breitling manufactures its own movements in-house, and the quality of every watch is confirmed by its status as a COSC-certified chronometer, made in Switzerland.